We all know that old punchline about having some swampland in Florida to sell. Well, the next huckster cliché might be about beachfront property in Florida. 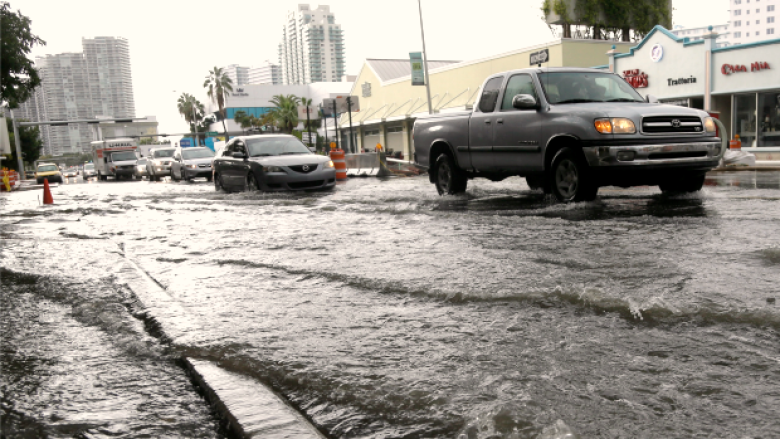 If the consensus of the world's climate scientists bears out, the coastline of South Florida is going to be pushed considerably inland by rising sea levels in the decades ahead. Between the expansion of the world's ocean water as it gets warmer and the melting of ice caps in Greenland and Antarctica, sea level will be at least 40 centimetres higher by the end of the century, according to the United Nations Intergovernmental Panel on Climate Change. And if the world doesn't get a grip on greenhouse gas emissions, it could be a metre, or even as much as three or four metres higher. You don't need to tell people in Bangladesh, the Netherlands, Venice or low-lying island states like Tuvalu or The Maldives about the monumental challenges and existential perils posed by sea level rise. We're less accustomed to contemplating the prospect of North American climate refugees. But Hurricane Katrina and Superstorm Sandy gave some hint of how vulnerable coastal North America is, and no place is more at risk than Miami and the rest of South Florida. That should give pause to many Canadians, even if they live thousands of miles from Miami. About 3.5 million Canadians travel to Florida every year and half a million Canadians own property in Florida, much of it along those fabled beaches. According to Harold Wanless, a lot of that property could well be worthless and literally underwater in a few decades. His word to describe the future of Miami? Doomed. Professor Wanless is the Chair of the Department of Geological Sciences at the University of Miami in Coral Gables, Florida. He also chairs the science committee for the Miami-Dade Climate Change Advisory Task Force.